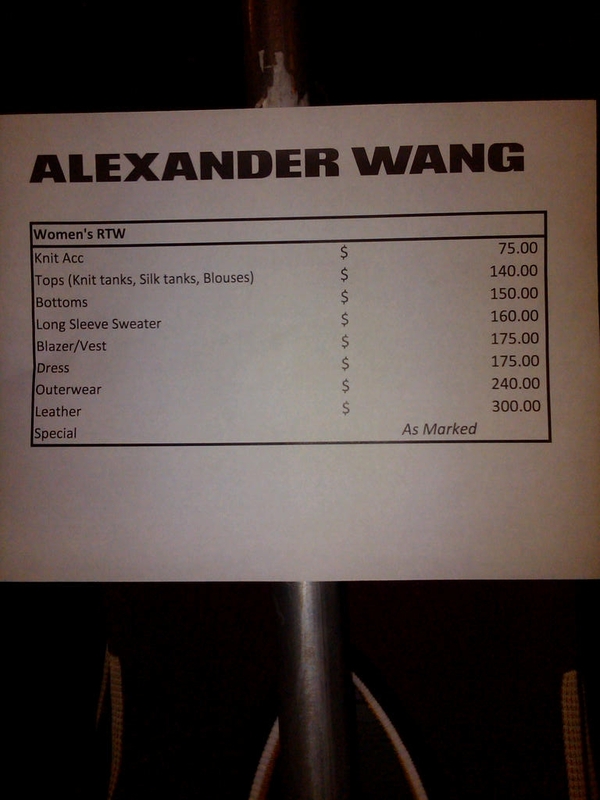 Usually the Alexander Wang sample sale is one of the most popular sales of the year. Shoppers wait for hours in the hope of snagging a popular Rocco bag or a bit of downtown chic on the cheap. This season, however, shoppers who invest hours in waiting to get in and then longer to pay may leave feeling disappointed. Today we visited the designer's VIP sale preview and if this evening was any indication you can be that there will be a VERY long wait to get in and check out tomorrow when the sale opens to the public sale. We stopped by the sale twice today – once during setup and again a few hours later after they opened. With only about 35 people on line in front of us we still waited 40 minutes in the evening cold. During our first spot-check we got a glimpse of a couple of popular Rocco handbags in gray and mustard. Unfortunatly, these prized deals were gone by the start of the sale. By the time we got in there were still a couple large Emile totes (retail $975) for $400 and Diego Bucket bags. Other assorted bags are priced by size. Clutches and small bags are $250 to $300, medium bags are $350 and large bags are $400. Most of the bag selection was spring and summer colors. In addition, there were some small leather goods for $70 to $90, but nothing worth the checkout wait! 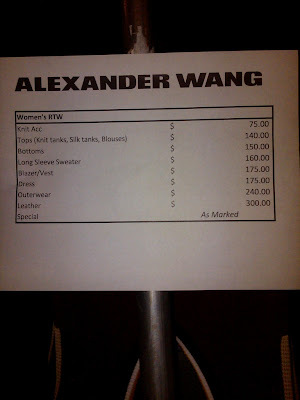 Moving over to shoes, we were disappointed not to find any of Wang’s covetable boots. Most of the sale selection was from the past spring and summer collection. At least the shoes were gently priced at $200, with the exotic leather versions for $300. 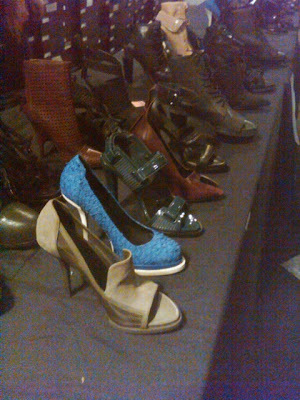 The bright blue exotic leather stiletto pumps were a big hit. While accessories were largely a fail, there were lots of $240 outerwear options, including some nice leather and fur options priced as marked. There are still a couple of lovely long fur vests for $2500 and less expensive fur trimmed jackets. We also found cropped red patent leather jackets for $300 and anoraks for $240. The ready-to-wear is generally quite pricey. Causal vests are $175 and $140 and silk tops and tanks are $140. The $175 dress selection was not great, although we fell hard for a leather corset style dress for $300. The diffusion line, T by Alexander Wang, ranged in price from $35 to $120 for outerwear and the majority of clothing was in the $70 to $90 range. On the Miscellaneous racks we found some of leftover sequined dresses from the last sale, as well as really nice summer beige silk dresses for $50. Many pants and separates are also $50 near the shoe area. You can see more pictures from our shopping trip here. Overall, we wouldn’t suggest spending all day waiting in line to get in and then lots more time to pay. Usually the sale includes a few additional markdowns wait times decrease substantially during the following days. Also, be aware of the lighting, which is pretty terrible. In this instance it doesn’t even make sense to wait to use the fitting room. Would it be worth heading down around 3PM to grab some menswear? I would suggest tomorrow afternoon. Thanks a lot. You dont think it'll be wiped out by then? hahahaha. Thats a bummer. I was really looking to grab some sweatpants and a few tees. Was it at least good for that or still a let down? Avoid this sale. I waited for two hours in the freezing cold only to find less than stellar options and a long checkout line. I left empty handed.